May 12-13, 2018, with a one-of-a-kind art exhibition setting up shop at Carpe Diem, Majorda. The ‘Anticlockwise’ exhibition, featuring artwork of various kinds by around 30 different artists from across the country, promises a weekend of great arty fun, with a chance to appreciate different forms of art, pick up a few interesting pieces and learn to make art oneself. There’ll also be a bit of lively light music, to set the mood! The brainchild of artist Shusha Oliveira, the exhibition will put on display artworks inspired by elements of the past, as well as those produced in the past by the featured artists; the references to the past were what gave rise to the interesting name ‘Anticlockwise’ – turning back the clock with work done from now to then, and inspired by elements from now to then, as Shusha explains. "A lot of us artists work on personal projects, alongside commercial ones, but never get a chance to put it out there for public viewing, and hence it most often goes unnoticed. Thus the primary purpose of the exhibit is to give young artists a platform to showcase work done in the past," she adds. Shusha, who in describing herself says, "I’m a graphic designer and illustrator by profession; besides art, I like archery, drumming, playing the piano, singing and solving Rubik’s cubes," mentions that the inspiration to host this unique exhibit came to her in a rather sudden way. "I woke up one morning and thought of doing something fun like this!" she says. The ball was set rolling in a small way, with Shusha sharing the idea with just a couple of people, after which her parents, sister, friends Sheina Paula Pereira Costa and Ashwin Sharma encouraged and helped her to get things started up… And in the end, the concept unexpectedly grew into a huge exhibit! "Right from the beginning, I knew I wanted to do this with a group of artists rather than go solo. But at that point, I had no clue that it would grow into such a large group of around 30 artists. I just kept asking artists if they would like to be part of this, and most responded in a positive way," adds Shusha. The group exhibit will bring over 30 artists, from various cities and various cultural backgrounds, each with their own unique style and their own way of looking at a subject, all together under a single roof at Carpe Diem. Most, like Shusha, are illustrators, but the exhibit will also feature the work of calligraphers, photographers and so on, each expressing themselves in a different creative medium. Visitors to the exhibition will have the opportunity to meet several of the artists and engage them in conversation about their artistic endeavours. Several works on display will also be up for sale, including framed paintings and prints, postcards, bookmarks and stickers, hand-crafted products, clothing, painted bottles and lots more. Some of the featured artists include Priyanka Kirve, a fashion and advertising photographer and a travel-buff who has shot editorials across Europe; Rajeshwari Vankit and Sunit Ajgekar who, using their sense of colour and composition, create beautiful abstract paintings with shapes and forms, to tell interesting stories; Nikhil Jadhav, Girjesh Jaiswar, and Rakesh Jaiswar, a trio of young, talented Mumbai boys, who, in addition to painting murals, work tirelessly to beautify plain and dull everyday objects such as the hand-painted bottles that will be on display at the exhibit; and Ashutosh Dhanawade and Pratap Chalke, illustrators who both create sketch-works in ink. Fashion photographer Aishwarya Batwal will showcase pieces from her own clothing line ‘rilli’, which represents her love of mixing styles and trying out new patterns, in an attempt to create something new and fresh. ‘Umber Stitch’ by Upasana Rupesh will bring out a collection of paper stationery including diaries, sketchbooks and other gift ideas, combining earthy simplicity with the elegance and charm of handcrafted art – "Each product is a labour of love," they add, "thoughtfully crafted and delightfully unique, truly one of its kind." In addition to the art exhibition itself, Anticlockwise will also be hosting three interesting workshops at the venue for both kids and adults that will be conducted by some of the featured artists. These include linocut printing with Poorva Shingre, where participants will learn to make stamps with lino and their very own gift wrapping papers. Azulejos tile painting with Ramdas Gadekar, where participants will create two-tile azulejos. Azulejos are a form of Spanish and Portuguese painted tin-glazed ceramic tilework, the use of which was and still is typical for the Portuguese to tell stories about their history, religion and culture. And finally, Basic Vitreous Enamelling with Meghan Salgaonkar, a workshop for those fascinated with glass and jewellery that will focus on using liquid flux and jewellery enamel on copper surfaces – participants will each make a pendant that will last them a life time. And to keep the upbeat atmosphere going, the evenings of both days will see live music performances by a group of talented young musicians from Goa and Mumbai – including Ajay Jayanthi, a multi-talented musician who is too humble to admit it, and a pro on the violin; Akshay Dakhane, singer-songwriter, and former Stage 3 contestant who writes about "odd experiences with his hypothetical girlfriend"; Ajoy D’Silva, musician and someone who can "turn a bad day into a good one"; and Koonal Bhandari, the founder of Sonata Music Academy and a lover of western classical and jazz music. To top it all off, the Anticlockwise organisers have picked the perfect spot for their exhibition – Carpe Diem, an Art and Learning Centre, equipped with an art gallery as well as creative workshop and performance spaces, located in an ancestral house in Majorda, South Goa. The venue sees a number of creative events throughout the year… yet even then, Anticlockwise promises to be a different, fresh new venture. Daegal Godinho, Director at Carpe Diem, in speaking about the exhibition, mentions, "The organisation of the exhibition is entirely in the hands of the artists. Carpe Diem is simply hosting it. But if I had to say anything I would say that there seems to be a tremendous amount of planning, especially in terms of the selection of artists, to keep the field as diverse and interesting as possible. And I must say that the organisers have put in much thought and effort to make it something very different from the usual solo or group exhibitions our galleries are used to hosting." 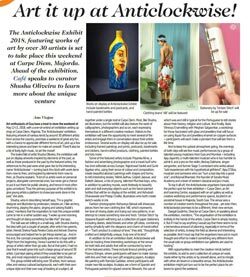 With opportunities to meet the creative minds behind the exhibits, to add to one’s collection of unique art work, made either by the artists or by oneself alone, and to mingle with other art-lovers in a beautiful venue, the Anticlockwise exhibition might just turn out to be the perfect place for art-lovers to spend the weekend.